The metal frame of the phone is built from aircraft grade stainless steel. The sides of this frame are grooved, something quite deliberate. Gionee says the rail-like design makes the frame more rigid, improves grip and also prevents accidental presses of the side buttons, which are recessed into the groove. This makes handling the phone a little strange, but we have to say it felt quite cool. It helps that it’s very thin, just 5.5mm. It’s not the thinnest dual-SIM phone they make it to be (that honor goes to the vivo X5Max), but it’s still stunning in person. The whole phone is a looker, with Gorilla Glass 3 panels on the front and back. We were quite partial to the Black color option, but it’s an absolute fingerprint magnet. The Elife S7 is also available in White and Blue, the White didn’t look as smudgy as the Black one. Anyway, on the front is a 5.2″ AMOLED display courtesy of Samsung, which Gionee says is 20% more efficient than regular AMOLEDs (like the one on the Elife S5.1 perhaps). The screen has great side viewing angles, contrast and legibility. The colors lean towards oversaturated though. To further help the 2,750mAh battery, the company has included a Dark theme. Using that instead of the default light colored theme reportedly draws 30% less energy. The Gionee Elife S7 is powered by a MediaTek MT6752. The heat produced form the 1.7GHz octa-core Cortex-A53 processor and the Mali-T760 GPU is distributed around the phone and radiated away. We still felt some heat when handling the phone, but it was kept in check. Gionee took a swing at Apple and all other companies that make thin phones but cheat with protruding cameras. Like we said, the company loves thin so it used the thinnest 13MP camera module (built on a Sony sensor), which fits snugly into the phones slender 5.5mm body. The phone also boasts an impressive sounding 8MP selfie camera. The company wanted the Elife S7 to offer a great audio experience so it endowed it with one oversized speaker. No, it fits just right in the body of the phone but Gionee says it’s much larger than competing speakers. It’s powered by an NXP amp and there’s also DTS audio processing. The phone is dual-SIM enabled, both cards going on the same tray. There’s nowhere for a microSD card to go though, so 16GB of storage is all you get. Anyway, the phone boasts connectivity up to 4G LTE with support for the local Chinese flavors of 3G and 4G. 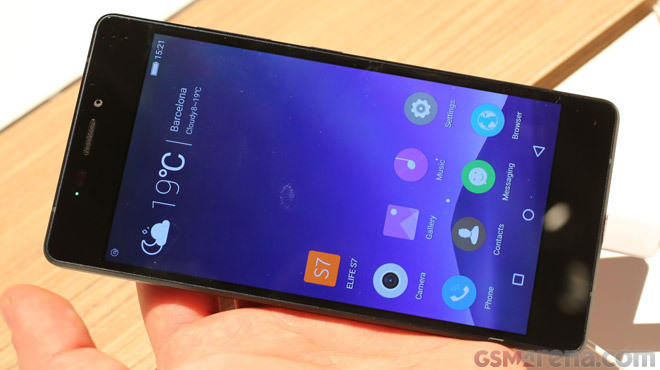 The Gionee Elife S7 will cost the hardly palatable €400 (it’s a great phone, but not €400 great). It’s going to India and Macau soon, but will also reach Europe. Not under Gionee’s own brand but instead as Kazam in Western Europe and AllView in Eastern Europe.